In a recent post I introduced the four phases we must transition through if the end-game is sustainability of “anything” we launch in the organization. I’ve also been harping on Point-of-Work for years now and feel it necessary to clarify that Point-of-Work is NOT just a destination; it’s a dynamic discipline. I say this because Point-or-Work is comprised of multiple POINTS-of-Work and is further defined by multiple attributes that either drive or restrain achievement of sustainable outcomes of “anything”. Failing to address these attributes effectively and efficiently puts sustainability at risk. 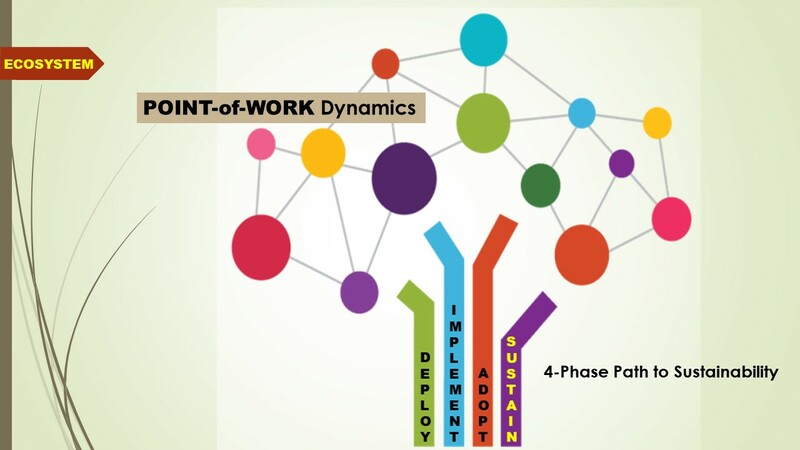 What’s so Dynamic About Point-of-Work? Again, Point-of-Work is not a destination as much as it is a dynamic discipline requiring that we discover multiple attributes that define if they are sources that DRIVE outcomes or RESTRAIN outcomes. The label of “discipline” speaks to the process we must undergo to identify which attributes drive and which restrain as a basis for making decisions about what we build as solutions – solutions that ensure whatever is driving continues to do so, and whatever is restraining is minimized or overcome entirely. PEOPLE/CAPABILITY – Who is engaged in the work? What skills are required? PROCESS/WORKFLOW – What is the work? Where is it failing? And why? CONTENT/RESOURCES – What assets are consumed/required to execute the work? TECHNOLOGY/SYSTEMS – What technology are/should be used to execute work? IMPACT/ANALYTICS – How is success measured? Are metric accessible & actionable? ENVIRONMENT – What internal/external work conditions exist? Risk? Urgency? Look at the graphic again. I’ve chosen this image for my website because it tells the story of how dynamic the ecosystem we must effectively embrace really is if we hope to sustain it. Every one of those dots in the Ecosystem represent a Point-of-Work. Points-of-Work for the primary users in their tack-centric, role-specific activities. Do you see anything in that list above that is static and/or unchanging? I don’t, and that’s why I’m locked down on the label “dynamic”. Another recent post I fired off this week was “PERFORMANCE SUPPORT: Is Devolution in Training Blocking Evolution in Performance” and it drives home the Training Paradigm blind-spot that despite huge evolutionary innovations in Training…which is only in the DEPLOY phase…we are devolving to neglect the additional three phases of the path to sustainability – Implement, Adopt & Sustain. My attempts in this post to clarify Point-of-Work are driven by the fact that L&D cannot simply pursue the Point-of-Work associated with the primary end-user…like we typically do when we target and launch a static training course. Even that statement gives away my main concern…target and launch a static training course…into a dynamic learning performance ecosystem? Thanks for reading…and be sure to check out the new LinkedIn Group I launched earlier last week to share thoughts knowledge & ideas – POINT-of-WORK Performance Support Solutions. ← PERFORMANCE SUPPORT: Is Devolution in Training Blocking Evolution in Performance?